I don’t know when Mom got the old Royal Typewriter. It was new – or nearly new – in my earliest memories of it. Perhaps it had belonged to her mother, and came into our home around the time Grandma Thelma died. Maybe Mom invested in it – as she did the large set of encyclopedias – to enhance the scholastic ability of her children. I don’t think Mom knew how to type, but I guess I don’t know that for sure, either. I think it originally had a hard case that fit over the top and fastened on the bottom, to protect the keys and keep it dust-free. The typewriter was an important, revered object in our house. As I think about it, very few objects in our chaotic household were treated as important. Mom raised nine children of her own, and always had many more around. She fully expected that “kids will be kids.” That meant, to her, that dishes will get broken, toys will be destroyed, clothes will get stained and furniture will take a beating. Expect it, and learn to live with it. Except for those things that Mom set aside as precious, that were to be handled more cautiously, and treated with love. Mom’s list was not long: the cedar chest that she’d received from her parents at the occasion of her high school graduation…along with the treasures and memories she kept inside it; books in general, and especially the encyclopedias, which had to be handled carefully, dusted regularly, and always kept in alphabetical order; the good china, which was never used, and the frosted iced tea glasses that had belonged to her mother; the nativity set that was put out at Christmastime and handled so carefully that the straw was still intact on top of the stable and the music box still worked for her great-grandchildren to hear; and the typewriter. When we came home from school with a “really big research assignment”, we could use the typewriter for the final draft. If we had an important letter to write, the typewriter could be brought to the desk. If we had absolutely run out of options for keeping small children entertained, we could sometimes pull out the typewriter to show them the “magic” of their names appearing on the paper, the sound of the bell alerting them that it was time for their job: using the silver arm to push the carriage back over to the left. Always, the typewriter eraser was close at hand. By the time we got to high school and actually took typing classes, the biggest problem was forgetting the “hunt and peck” method of typing we’d grown so familiar with. My mother gave me the typewriter when I was a graduate student at Michigan State University. By that time – the late ’80’s – her children were all adults, and the machine sat idle. Though a manual typewriter seemed pretty archaic, it was a godsend to me! The only word processor available for my use – for the multitude of papers that had to be typed – was at the library, a mile from our apartment, with – often – a long list of students in line to use it. I was a single mother with a full load of classes, and no car. Having the typewriter allowed me to be at home with my daughters in the evenings. Many nights they fell asleep to the sound of me pounding on the typewriter keys, cursing as I reached for the White-Out. I still have several papers written during that time, with the characteristic shading from many corrections. I made cookbooks for my daughters one Christmas many years ago. The opening page says “so that Jenny and Katey can have the food they grew up with, even when ‘Home’ is far from their Mom’s kitchen”. My methods were ancient by today’s standards. I gathered photographs and had them enlarged and/or cropped as needed. I used rub on Chartpak letters to make the chapter pages. I typed all the recipes on Mom’s old Royal Typewriter. A dozen hours over the course of several days and a couple hundred dollars at Kinko’s,and I was done. That was the last big job for the typewriter. First, my mother died. Which caused me to reassess everything. Caused me to look with new eyes at everyone and everything she loved. Caused me to cherish everything she had cared about, and everything she had given me. Next, I saw a lovely room in an art magazine where a typewriter was used for making gift tags, and had a place of honor on the desk.Then I saw a piece on a news program about a typewriter repair person who is enjoying a resurgence of interest in the old machines. Last, I reorganized shelves and books to accommodate a new drawer unit, and ended up with one empty shelf. 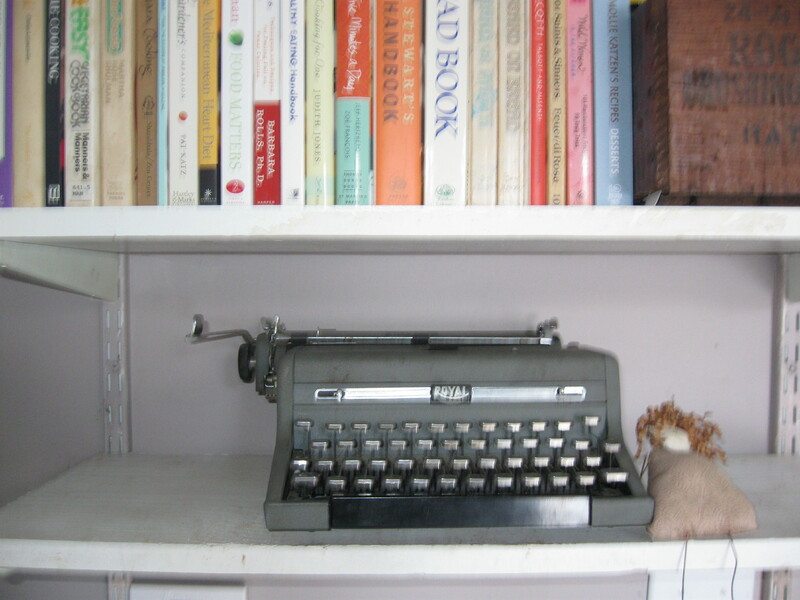 Now, Mom’s old typewriter sits with dignity on my kitchen shelf. The cabinet is painted and in the kitchen. The drawers are – mostly – filled and in the cabinet. The books are back on the shelves. The old cabinets and counter have gone to good homes. I celebrated by giving my newly rediscovered floors a good sweep, and inviting a friend over for dinner and a movie. Dinner was roasted turkey, mashed potatoes and gravy, broccoli, popovers, and raspberry cheesecake. My friend brought wine, and good conversation. The movie was Anne Frank. A fine finish to a big project! It’s not that I haven’t accomplished anything today. Actually, that list is quite long and runs the gamut from regular daily chores to stripping beds and washing blankets; from sealing several collages in my studio to making home-made dog treats. The problem lies not in what I’ve done, but in what I haven’t done. Procrastination is not without it’s benefits. 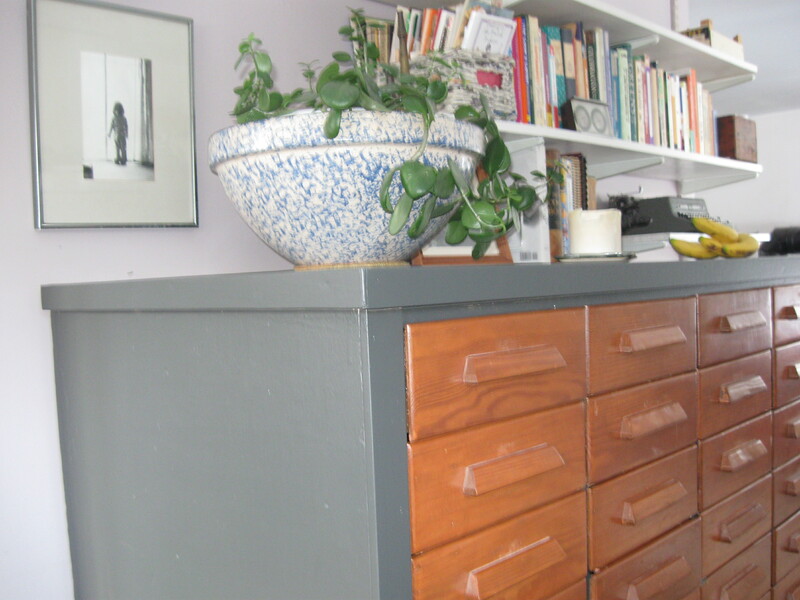 When trying to avoid one activity – in this case, rearranging my kitchen to fit my new 32-drawer apothecary cabinet in it – I can find tremendous energy for many others. So, I’ve answered letters that have been waiting weeks for my response, I’ve read a magazine that has been sitting unopened for two months and I wore the dogs out with two long walks.I’ve gone through old photos; I’ve cleaned out old files. I have dog treats baking and my bread rising, soup on the stove and fresh sheets on the bed. My fear is – no, not a fear, but sure knowledge – that once I start emptying shelves, I am going to be in an even bigger mess. I can’t figure out how to do this in an organized way. If the cabinet was here, I could be filling the drawers and putting them in place. As it is, I’m filling the drawers and moving them from my laundry room floor to my dining room floor. The mess is just spreading! 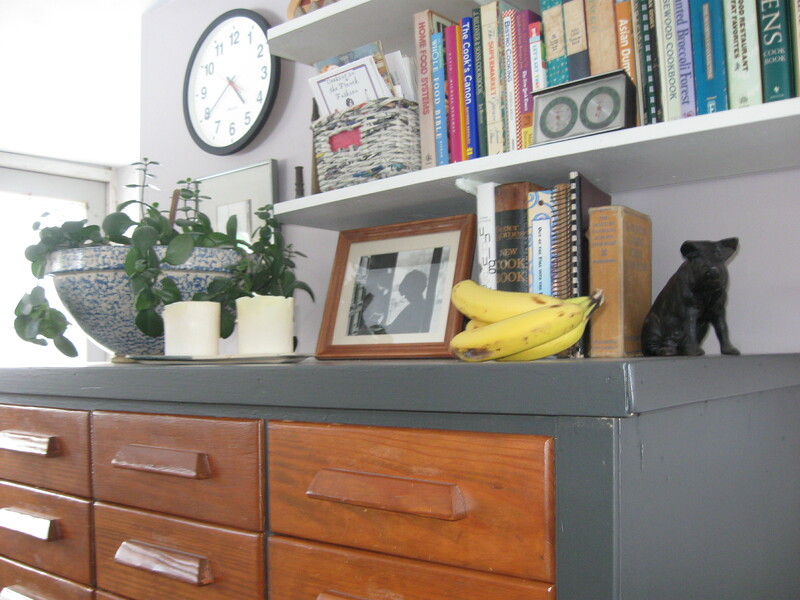 The cabinet cannot be brought in until the old cabinets…and counter-top, shelves and table…are moved out. There is no garage. It’s winter! This stuff is heavy! So, now it’s almost seven PM. Time to feed the dogs, get myself a bowl of soup and a glass of wine, and re-think this project.